Ralien | Saying what needs to be said & doing what needs to be done. Saying what needs to be said & doing what needs to be done. Let me take you on a journey with youth around the world. I want you to put yourself in the shoes of an innocent young person. Can you imagine, yourself struggling to stay alive? Living in danger and fear all day and night? Can you imagine, no access to the most basic needs, risking to die of hunger or thirst, or no access to toilets or tampons? Can you imagine, no education, skills or training? Or being abducted or shot on your way to school? Can you imagine, no employment? Not knowing what to do with yourself, with your life? Can you imagine, your livelihood threatened because of climate change, or having to escape your flooded home? And can you imagine, being the largest part of the population, but having no say in any decision being made about your life, your future, because of systemic corruption in your country? Just imagine. And put yourself in the shoes of a young person, that lives like that, every day. This is not an exception. It is a very common reality, most likely far outside our comfort zones. Innocent children and youth all around the world are struggling right now. Suffering from crises and conflicts all around the world And soon, many more wars will arise over water, food and scarce resources. If we don’t act NOW. and no consensus on peace, justice and human rights. This is not the world I want. Nor any young person to my knowledge. Politics, profits and power are overruling people and planet. This is an unacceptable reality. In this perspective, my generation is one with poor prospects, and ending hope. Do you want that? However, young people also possess endless potential, and we are drivers beyond this status quo. We, the young people, in all our diversity, are the future, and we are here right now. There are 1.8 billion of us. About 87% living in developing nations. And young people around the world are acting now. We are leading revolutions, we innovate, we solve challenges as social entrepreneurs. Young people are a significant as well as a neglected part of the solution. We are your greatest asset, if only… It is time to unite with the young people, it is time for you to reach out and include a new generation, acting together, harnessing the power of the crowd. And let me be clear. We all owe it to the young people that are struggling, to do more than we could possibly imagine, to rise beyond ourselves. Going beyond the system as it is, doing what must be done. No longer quietly accepting what is truly not right. Achieving this will never be possible, when working alone. This is not a one man’s game. Influence comes only to those that collaborate. Build a strong connected network of civil society and new allies all around the world, focusing on lasting impact. Dare to be critical about others, as well as about ourselves, continuously trying to improve. We all need to get out of our comfort zones and show real courage. We will only win when united as nations, as organizations, and as people. Doing good is no longer enough. Post-2015 should be about doing better, together. I could go on for hours. But we should really stop talking now, and start doing. And clearly, my time is up. Don’t let us run out of time by talking too much. Because in reality, way more important than words, are bold actions. That is what will ultimately determine the future. And bold actions aren’t going to be taken by somebody else. Those actions need to be taken by me and you. Yes, you. What is stopping you from doing more? Imagine standing in a young person’s shoes. What will you change today? Special thanks to my friend Apurva Mathur for her support in creating this statement. In juli hebben we als jongerenvertegenwoordigers keihard gewerkt aan de “laatste loodjes” van de Sustainable Development Goals (SDGs). De UNGA Open Working Group on SDGs heeft het mandaat om een voorstel te doen voor de doelen, die straks in september 2015 na een proces van intergouvernementele onderhandelingen echt zullen worden afgetikt. Het was een heel spannende en zware periode met onderhandelingen onder de OWG: de laatste dag hebben we zelfs 28 uur aan een stuk doorgewerkt, waardoor uiteindelijk de conclusie werd bereikt om 1 uur ‘s middags op zaterdag. Maar we hebben een (acceptabele) uitkomst. Klik hier voor het uiteindelijke outcome document. Omdat het informele onderhandelingen waren hadden we als internationale jongeren geen officiële mogelijkheden om te participeren in het proces (behalve in de zaal zitten, maar we hebben geen enkele keer iets mogen zeggen). Daarom was het voor ons van belang om vooral veel bilaterale meetings met landen te organiseren en nog belangrijker: om creatief te zijn. Op allerlei manieren hebben we geprobeerd om onze stem toch te laten horen. Niet zonder succes(jes). We mogen best tevreden en trots zijn, maar er is nog een lange weg te gaan! Get involved! Recently I was admitted to a great master’s program on environmental management and sustainable development at Yale University. Unfortunately I have been rejected for all scholarships in the Netherlands so far. Therefore I started a crowdfunding campaign so that I can still go study and prepare for a career in sustainable development practice: www.raliennaaryale.nl/international! In 2030, how old will you be? I would be 38. I suppose I will be a mother by then. To begin, let me tell you about my future daughter. If we do our job right, she will know poverty only from the history books. She will learn that even though we once risked great environmental disasters and resource scarcities, we succeeded to realize effective strategies for sustainable development, which prevented her generation from what could have been a true nightmare. Regardless of the place in the world where she grows up, she will live in an environment completely free from any form of discrimination, an environment where young women like herself can fully participate and are leading important change, where all human rights are guaranteed, which includes access to any sexual and reproductive rights, an environment free from fear for conflict and disasters. Just like any other young person around the world, she will grow up in an environment surrounded by opportunities, including plenty green job opportunities for the young, and she can fully develop herself and her potential, so that she can soon meaningfully contribute to society. Because my and your generation showed her how to create necessary change and care for the earth. That is the world I want to leave for my future daughter. That is the world I want to create with you. But to create the future all people want and need, bold action is needed today. Unfortunately in the world of today much still needs to change to unlock full potential of its young people but also of women, and to truly eradicate poverty and build sustainable systems and societies. The post-2015 development agenda must ensure both. In the world of today, young women my age and actually women of all ages are still sexually abused and violated – shockingly often – and they do not necessarily have the rights and freedom to make informed choices about their own lives and bodies. In the world of today, young girls – it could have been my 9-year-old sister – are still forced into child marriage. In the world of today, my 7-year-old brother could have been a child soldier or undergo harmful child labor. In the world of today, we have the greatest ever population of young people, but in many places we have only little if no real say in our own future, while for us most is at stake. This is what happens today and keeps us from developing our societies to the fullest. Remember that what we let happen to children and youth elsewhere, could have been your family too. Before 2030, everyone must be truly equal. We need young people’s and women’s leadership to push this agenda forward. We need to see significant increases in women and young people in the real decision-making processes, also those behind closed doors and in comfortable backrooms. Moreover, isn’t is about time that we appoint a female Secretary General, and what about a female PGA? Nothing against the great work that his excellencies have done so far, of course =) Women and young people are key to making sustainable development a success – we must be equal partners. It’s young people and women we need to invest in today, as we are the economic potential and social capital we need for the world of tomorrow. Even though the post-2015 goals will probably only last until 2030, their effect must go beyond. In those 15 years we must lay a basis for true transformation, on which my and next generations can build. We need to have a long term view on the development of the world. In 2030, we will be facing huge environmental risks from climate change, water scarcity, ocean acidification, deforestation, biodiversity loss, and ecosystem degradation. We cannot afford to jeopardize the planet and the lives of future generations, only to achieve short term profits and satisfy short term interests, leaving a world behind where new drivers of poverty are existent. Short termism however, is what our current economic and political system is largely based on. This can and must be tackled by reversing current perverse and unsustainable economic incentives, eliminating all direct and indirect fossil subsidies as soon as possible, pricing external social and environmental costs of economic activities, taking serious the pollutor pays principle, moving beyond GDP, and transforming our outdated linear growth model into circular economic systems, which includes for example zero waste, smart resource usage and cradle to cradle strategies. What we need is better quality growth with less damage to the natural environment. It is possible to create a new, sustainable and equal economy, and many young people are already leading the way on local levels, if only we dare to change. Also we should seriously look at our investment choices. At this moment young people around the world are campaigning not to invest, but to divest from fossil fuels. The so-called carbon bubble poses huge financial risks for the future. We can’t keep valuing fossil fuels that should stay in the ground (that means two-thirds of all current reserves) in order to achieve the 2-degree climate change target Parties agreed to under the UNFCCC. And that whilst two degrees warming in general will already have severe and unequal impacts for many people, especially in the most vulnerable areas. We don’t need fossil fuels to survive. It’s rather the opposite. There are planetary boundaries which have to be included and tipping points that we can not cross, and which we are fastly approaching if we don’t turn things around quickly. Not only are there many unsustainable incentives that push in the wrong direction, we are literally discounting future generations in economics, as we undervalue the future in calculations by using an unequal discount rate. The future is simply worth less. So in that sense, there’s no need to take long term action or to invest in the future because everything today is worth more anyways. The value of future generations should at least be equal to that of our generation. We undervalue the future, but overcalculate profit from unrenewable resources, and in addition, costs of inaction on for example climate change continue to increase year after year. Today’s youth and future generations will inequitably suffer the costs, but also the dangers, fears, and increased risks. We can no longer procrastinate. 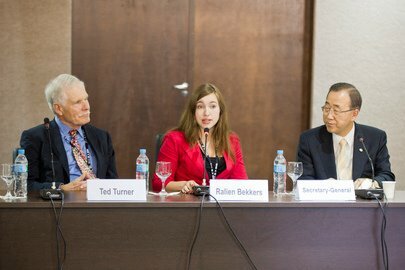 If we want true sustainable development, we should strongly integrate the needs of young and future generations in the post-2015 agenda. 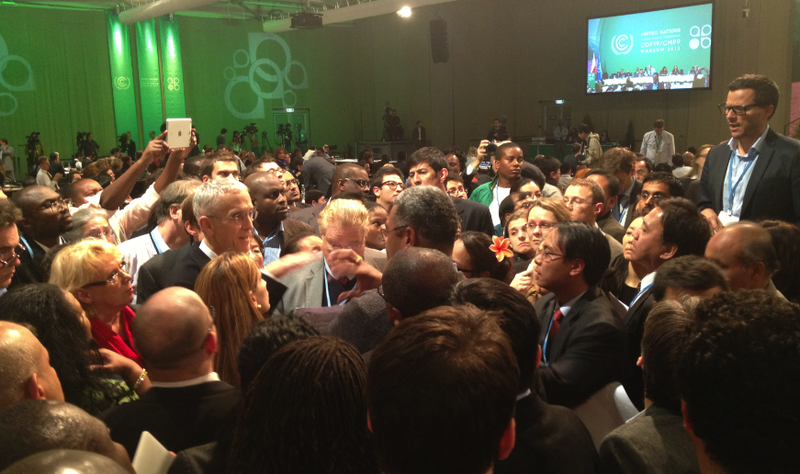 We need somebody to step up for them, like the Ombudsperson from Rio+20. We need long termism and not only look at the past and the present, but also at our shared responsibilities in the future. From a youth perspective, I challenge but also urge you to move beyond the North-South divide, to think about the global commons and to create a universal agenda for global prosperity. You need each other in this, and we need all of you, to take action. Caring about future generations means caring about tomorrow’s young people. Caring about young people means caring about the future… well, you? The challenges we are facing, discussing, and want to solve, require effective and diverse partnerships in order to achieve the biggest impact. All groups, all stakeholders, all generations must be part of this agenda and find an active role in the implementation. But to get there, we must all feel the ownership. We need engagement and collaboration beyond the usual partners, strong empowerment of citizens, universal education for sustainable development – starting from the youngest age possible – and we need powershifts, men to women, and from the older to the younger. Both men and women should be able to make decisions. Both the older and the younger should be part of decision-making. We should do it together, create the common future together. It is not possible to create an agenda and impose it on “the people” in 2016. We need to reach out to all of those not privileged to be here, and most of all listen to them. Not only do people desperately want to be included, we have to be included for post-2015 success. Because in case you haven’t noticed yet, the time of top-down as we know it is over, that’s not gonna save our world. We need the people in the communities, working on the ground level, ensuring implementation. Especially the next generation, their energy and innovative minds. Therefore active engagement needs to be strengthened and start now. We should use the post-2015 development agenda as a means to gain new trust in UN processes from people around the world, by giving them voice, space, and make them key part of the agenda. Without real people involved, words will be empty and goals can never ever be reached. (1) that under every SDG focus area, specific targets or subgoals on youth are developed. Today’s young people are more than willing – and probably the best ones to ask – to help you draft those. (2) that the lead of countries such as Sri Lanka and the Netherlands is followed by others as well, and that Member States closely engage young people in national youth delegate positions, in the coming 18 months of the process and beyond. 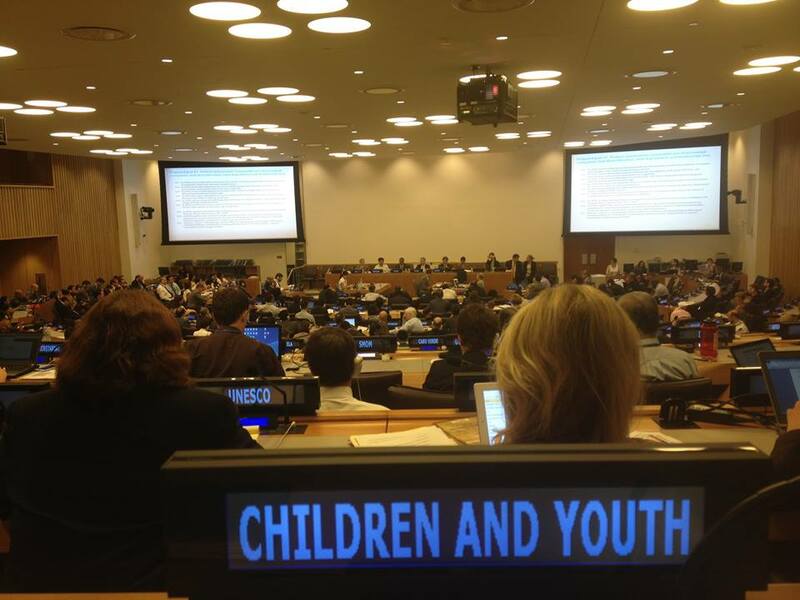 (3) that after 2015, especially in the High Level Political Forum, young people and other non-political stakeholders are strongly included and are given a critical and central role, even though the name of the HLPF might suggests otherwise. (4) we must also ensure that all the wonderful remarks made by Member States yesterday and today regarding the crucial role of young people for post-2015 development, will be reflected not only in this event but also in the OWG and the 69th session of the UNGA. (5) that information and open data is provided so that the potential of the mass will be unlocked and can publicly overshadow the influential lobby from business as usual behind the scenes. (6) and that back at home, we start an inclusive conversation about the role of the people in post-2015, to make them part and prepared to help taking on the challenges that the goals will bring once they are decided upon. (7) and last, that all young people will be educated and aware of the sustainable development goals and the challenges of our generation, in which they all should be able to play an active role, for example as social entrepreneurs. 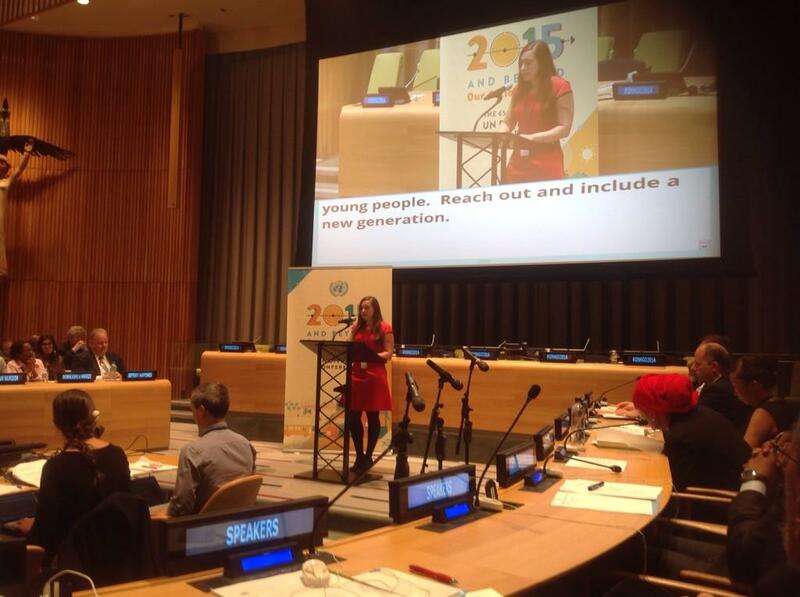 What concrete steps will you take, to work on intergenerational equity and justice, and include the young, in post-2015? Saying it is important is one thing – and the easy part – taking us serious in practice is less common. I mean, how many Member States brought young people here to talk and work with them, instead of talk about them? I look forward to hearing your concrete actions. We OWE it to the people back home to do all that’s possible – and more – to be inclusive. We OWE it to the people to create a truly ambitious and transformative agenda. We owe it to people everywhere in the world. Even though the political process might be tough, never forget that it should be about people’s lives and not primarily about process and politics. And I know that many, many of you have doubts about political feasibility of a transformational agenda. While science tells us, that if we really want to and have enough willpower, we CAN do it, we can create the huge change that is needed. If you say that technological feasibility is there, but political isn’t, it’s you that has MUCH of work to do. Please, don’t fail us. But work with us. 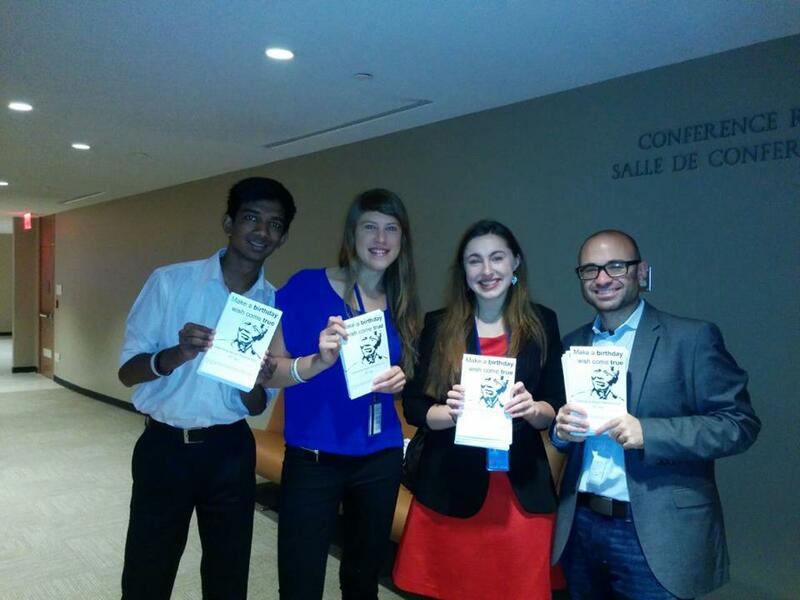 Young people around the world need you to work together, to unite as a team, and we need you to work with us. You OWE it to all young people and those still to born into this world, to be bold. To be strong. To be courageous. To take long term responsibility. To be transformational and life-changing. We count on you, and you can count on us to join you — if you let us. I don’t want your applause. I want your action. I don’t need your praise. I need your politicians to take me and other young people serious. I am proud to be here with you. But I would much rather be proud of you. Proud that you promise me to do what needs to be done. Ik ben geen overheidsvertegenwoordiger, werk niet bij de VN en ben geen NGO of bedrijf. Ik ben een jongere. Momenteel ‘jongerenvertegenwoordiger’ naar de VN. Ik maak VN-processen die beslissen over mijn toekomst en die van mijn leeftijdsgenoten en toekomstige kinderen van dichtbij mee. Hierbij de belangrijkste lessen die ik daaruit heb geleerd. Men zou eigenlijk niet eens moeten ‘onderhandelen’ over klimaat, maar men zou samenwerken als uitgangspunt moeten laten gelden, wil je klimaatverandering aanpakken. Iedereen komt momenteel met z’n eigen belangen naar een conferentie en maakt het daardoor verdomd moeilijk om tot een gemeenschappelijke overeenkomst te komen. Het is gevaarlijk als men te veel vast blijft houden aan eigen punten (ofwel: hard onderhandelen) en daardoor vergeet dat we samen eigenlijk iets proberen te bereiken hier. Dat is een van de grote issues die vooruitgang tegenhouden in mijn ogen. Waar het gaat om de lange termijn, moeten we toch echt de durf hebben en tonen om onze persoonlijke belangen opzij te leggen en te kijken naar het grotere plaatje. “We’re all in this together. We’re all on the same planet.” Het zal bovendien voor niemand makkelijk zijn om met klimaatverandering te dealen en om CO2-uitstoot te verlagen, maar als we uiteindelijk niets doen omdat iedereen alleen maar wilt wat voor hem/haar het belangrijkst is en persoonlijk beste uitkomt, komen we nooit echt ergens. Klimaat zal niet moeten worden onderhandeld, maar moeten worden behandeld in een sfeer van samenspel, alle landen samen, in het belang van het leven van de mens op aarde. Men heeft ondertussen (hopelijk) wel begrepen dat klimaat niet zomaar over natuur en milieu gaat, maar het gaat grotendeels om de economie. De schade en gevolgen door klimaatverandering kosten steeds meer geld, zowel de directe impact (op leefmilieus, oogsten) en aanpassingen aan verandering, als het verminderen van de menselijke invloed op het klimaat (minder broeikasgassen uitstoten). Alles kost geld en raakt de huidige economie steeds meer, zoals nu ook WorldBank, IMF en World Economic Forum regelmatig roepen. Maar niemand wil er op dit moment geld aan besteden; de meeste effecten van de investering zijn namelijk pas op langere termijn zichbaar en daar houdt men niet van. De klimaatonderhandelingen blijven telkens maar vastlopen op de vraag wie, wanneer, hoeveel geld moet betalen om de negatieve effecten tegen te gaan. Why!? Ons huidig economisch systeem is zodanig ingericht dat economische groei/ontwikkeling voor meer CO2-uitstoot en daarmee klimaatverandering zorgt, doordat wij onze economie nog steeds laten draaien op vieze fossiele grondstoffen als olie, gas en kolen. Van deze brandstoffen en van het huidige model zullen we af moeten. Dat kan zeker, een aantal bedrijven nemen daar al de leiding in, bijvoorbeeld aan de hand van nieuwe economische modellen, zoals de groene economie (op basis van renewable energy sources), of de circulaire economie (waar grondstoffen in kringlopen gaan en waarde behouden). Maar de economie hervormen doe je niet zomaar. Zo zit ons systeem momenteel vol met tegenwerkende incentives die korte termijn economische winst boven het langere termijn behoud van het milieu verkiezen. Niet alleen is dat eigenlijk de essentie van onze huidige economische groei, ook versterken we dit zelf door bijvoorbeeld (grotendeels voor algemeen publiek onzichtbare) subsidies op extractie en gebruik van fossiele brandstoffen (minstens 6x hoger dan op hernieuwbare brandstoffen). Dat werkt natuurlijk de business case voor duurzame energie en economie tegen. Uiteindelijk gaat dit punt in principe volledig om prioriteit en politieke wil. Het is onzin dat het geld er niet is. Het geld is er zeker. We besteden als wereld jaarlijks bijvoorbeeld wel miljarden aan oorlogen en het redden van banken. Politici moeten dit echt, echt een stuk serieuzer nemen, ook al overschrijdt het de 4 jaar van hun termijn en zullen de directe effecten pas later zichtbaar zijn. Klimaatverandering zou prioriteit moeten zijn voor iedereen, juist ook omdat het zo nauw verweven is met de economie van de toekomst. Weg met de kortzichtigheid: politieke wil, moed en prioritisering is noodzakelijk. “If the climate was a bank, it already would have been saved…” Think about that. We hebben een probleem. Voor het 2e jaar draai ik nu mee met klimaatonderhandelingen en werk daar samen met de internationale jongeren. Niet alleen hier in Warschau, maar vooral ook vorig jaar in Doha, Qatar, ben ik mij rot geschrokken van de manier waarop jongeren soms net zo goed lijnrecht tegen over elkaar gaan staan. Niet om de inhoud, want we willen allemaal onze toekomst veiligstellen en klimaatverandering aanpakken, maar om de manier waarop we dingen doen. Daarom was men vaak vooral met elkaar bezig in plaats van met het grotere proces van de klimaattop waar we onderdeel van zijn. Eindeloze, strijdlustige en destructieve debatten en uithalen in onze ochtendmeetings danwel via de email of achter ruggen om. Het vreet ieders energie op en we zijn mega-onproductief. Onze invloed op het proces stelt ook hierdoor amper wat voor; we zijn niet verenigd en houden elkaar zelfs af van echte dingen doen. Zo blokkeerden bijvoorbeeld een aantal wat extremer denkende jongeren onze mogelijke bijdrage aan een conferentie waarbij een fossiele partij betrokken was; we hadden podium gekregen (net zo goed om kritisch te zijn) maar we zouden hier als jongeren niet heen moeten “want zij zijn slecht”. Ik denk WTF, dat denkt ook de meerderheid, dus de discussie duurt uren, maar als men toch besluit te blokkeren gebeurt het gewoon niet. De eeuwige vloek van consensus. Het kostte ons uren, enorm veel energie, en levert ons NIKS op: het event gaat door zonder ons, niemand merkt iets, we missen een kans om onze kritische stem te laten horen (maar zeiken wel over het feit dat we nergens worden gehoord), enzovoorts. Sorry, maar je snapt aan welke kant ik sta en dat dit soort enigszins onnozele gevechten behoorlijk frustrerend kunnen zijn. Vooral is de sfeer ook niet te harden omdat er meningsverschillen zijn over die “hoe”-vraag. Steeds minder mensen komen nog opdagen en er is een voelbare spanning tussen verschillende partijen. Daarbij een enorme dominantie van jongeren uit Noord-Amerika, Europa (ja, inclusief wijzelf) en andere ontwikkelde landen. Al met al: het lijkt de echte (onderhandelings)wereld wel. En daar maak ik me misschien wel het meeste zorgen om. Als wij als jongeren al niet goed samen kunnen werken, hoe moet dat dan in de toekomst? We moeten ons als een gek gaan beseffen dat dit niet kan, maar dat “we’re on the same team”! Je schakelt toch niet je eigen teamleden uit!? Dan verlies je zeker… We hebben al een veel te grote wereld vol macht, geld & fossiele belangen die de touwtjes in handen houden tegenover ons staan, waar wij tegenop moeten boksen. Zorg er daarom voor dat je vertrouwen opbouwt (en als je dat niet hebt, actief op zoek gaat naar manieren om vertrouwen te winnen, dat kan zelfs een biertje onder vier ogen zijn), maar vooral ook begrip en respect ontwikkeld voor de andere partij(en). Daarbij gaat het in mijn ogen vooral ook om acceptatie; zie in dat je allen hetzelfde doel voor ogen hebt, maar dat men wellicht andere ideeën kan hebben over hoe daar te komen. Zolang dat het geval is, is het een zaak van accepteren dat jij niet altijd gelijk hebt en jouw ideeën niet altijd het beste of vooral het enige goede zijn, maar laat daarentegen iedereen doen waar hij/zij goed in is en draag daarmee gezamelijk bij aan een veel groter geheel! In Warschau zijn op de een na laatste dag 800 NGO-vertegenwoordigers vertrokken omdat ze boos waren om de enorme invloed van fossiele industrie, en de verschrikkelijk lage ambitie van de landen op deze klimaattop. Echt volkomen terecht. Maar waar ik van versteld stond was de opmerking van een van deze NGO’s: “ondanks het feit dat we zijn weggelopen van de onderhandelingen, hebben we nu een geweldige onderhandelingspositie.” Ik viel echt van mijn stoel. Je bent er niet, dus HOE DAN? Volgend jaar terugkomen is te laat! Toen wij uiteindelijk in het heetst van de onderhandelingen met maar een handjevol (jongeren-)NGO’s over waren gebleven en het bericht kreeg dat de anderen lekker aan het zuipen en feesten waren, werd ik dan ook behoorlijk pissig. Lekker solidair, jongens. Die uitkomst wordt er echt niet beter van als je als terecht kritische NGO’s wegblijft en landenvertegenwoordigers, bedrijven en een handjevol jongeren het laatste werk laat doen. Kom op zeg. Waarom ben je naar Warschau gekomen (gevlogen)!? EIS vooral ook dat je wordt gehoord. Dat NGO’s amper momenten krijgen om mee te praten in de onderhandelingen en wat urgentie en verfrissing te brengen is zonde, voor beide kanten en dus voor het algehele proces. Dat wij als jongeren (en NGOs) pas een eindstatement mogen maken aan het eind van de onderhandelingen, als alles al is besloten en als bijna iedereen al naar huis is vertrokken, is niet alleen ronduit schandalig maar wederom ook een gemiste kans. Als het jongerenstatement niet op zaterdagavond 9 uur was geweest maar vrijdagochtend 10 uur, had dat wellicht een wat andere toon gezet voor de eindsprint. NGO’s: sta op voor jezelf. Nee, dat is niet makkelijk in dit proces, maar je voornamelijk focussen op acties met boze statements en daarna een grote walkout gaat je zeker veel mediacoverage opleveren, maar vrijwel NUL invloed op de uitkomst van de onderhandelingen, sorry to say. Mijn mening, op basis wat ik binnen heb zien gebeuren. Ik was echter niet de enige. Wat ik de afgelopen tijd in mijn werk rondom de VN heb gemerkt is hoever de processen afstaan van de levens van mensen (terwijl het daar in essentie wel over gaat) en hoe dit in mijn ogen een van de grootste uitdagingen voor de VN gaat worden. Ik spreek jaarlijks met duizenden jongeren – voornamelijk voor verschillende schoolklassen – over klimaat, duurzaamheid en de VN. Eerder gehoorde uitspraken zijn “Maar de VN doet toch niets?” of “De VN is heel slecht en corrupt en betekent niks voor gewone mensen” of ”De VN praat alleen maar en ze lossen nooit iets op” en “VN… Ik ken wel de Verenigde Staten?”. Het beeld wat heerst van de VN en de processen – zeker klimaattoppen – is over het algemeen erg sceptisch, wat zonde en veel te makkelijk is. Kritiek is zeer goed en hard nodig, maar de VN gewoon maar opgeven lijkt me een heel ander verhaal. Ik heb er eerder met leeftijdsgenoten over gesproken en een mooie uitkomst vind ik de volgende. Als je een probleem hebt met de VN (en aan de kritiek en scepsis te horen zijn dat er veel), doe er dan zelf wat aan. Of je nou bij de VN gaat werken, je er op een of andere manier tegenaan gaat bemoeien, of ervoor zorgt dat hetgeen dat landen hebben ondertekent ook in praktijk wordt gebracht (bijv. door de overheid op verantwoordelijk te wijzen danwel zelf mee te helpen om zaken in praktijk te brengen), dan hebben we het ergens over. Het gevaar zit hem erin dat men de VN te irrelevant gaat vinden. Zo komt er sinds de klimaattop in Kopenhagen (ja, elk jaar na 2009 was er wederom een klimaattop) bijna geen journalist meer naartoe en staan de artikelen getiteld “Klimaattop mislukt” al klaar voor de zaterdag na de top (vaak wanneer we nog midden in uitgelopen onderhandelingen zitten), meestal ook nog eens een kopie van het artikel van vorig jaar. Hoe erg ik mij ook stoor aan deze slome, logge processen, ik blijf de VN een enorm belangrijk instituut vinden. Stel je eens voor dat we geen overlegorgaan voor alle landen zouden hebben? Dat we niet meer zouden proberen wereldvrede te behouden? Er zijn genoeg issues waarop de wereld zonder direct dialoog, door miscommunicatie (geen goede communicatie) misschien wel zou kunnen ontploffen. Dat we grensoverschrijdende problemen los van elkaar, ongecoördineerd en alleen nationaal zouden pogen op te lossen? Klopt, er moet nationaal zeer veel gebeuren, maar dat staat niet los van wat wij als wereld, samen moeten doen en zien te bereiken. Ik ben na wat ik van binnen heb gezien zeker van mening dat de VN momenteel niet voldoende resultaat bereikt. Dat zit hem ook in de VN zelf. De huidige processen zijn ook niet meer van deze tijd, veel te bureaucratisch, langzaam en ineffectief. Het matcht niet langer met wat echt nodig is in de snel veranderende wereld; dit lijkt de VN op het moment niet te kunnen opbrengen. Het is dus de uitdaging om besluitvorming op het lastigste niveau (met bijna 200 landen, niet eens individuen, maar landen – just imagine) te verbeteren en versnellen, en daarnaast interactie en verbinding met de mensen “on the ground” te creëren en daar ook de waarde van inzien. Het een kan niet zonder het ander, wat bij de VN wordt besloten heeft invloed op jouw en mijn leven. Beter zijn we dus allemaal zowel op een of andere manier nauw betrokken bij de beslissingen, als actief bij de uitvoering daarvan, in onze eigen landen. Voor wie mij kent, ik draag altijd iets roods. Rood, de kleur van passie (voor duurzaamheid), actie (om klimaatverandering aan te pakken), en liefde (voor de toekomst). Maar vooral is dit strategisch: je valt op, mensen kunnen soms niet om je heen, en ze onthouden je. Voor mij is dit gunstig, maar eigenlijk is dit helemaal geen goed teken. Dergelijke onderhandelingen – en überhaupt de (beslissings)macht in deze wereld – worden nog steeds massaal gedomineerd door de grijze – blanke – mannen in donkergrijze pakken. Hierdoor worden processen veel te veel gedreven door mannelijke eigenschappen – sorry mannen: ego, eigenbelang, macht, bezit, strijd, vechtlust. Zaken die niet bepaald overeenkomen met wat eerder is aangehaald als nodig voor het bereiken van succesvolle afspraken voor klimaatverandering. Daarnaast zijn het ook de oudere mannen die daar al jaren zitten. Geen vernieuwing betekent ook weinig verandering in het onderhandelingsproces. Het proces dat al jaren behoorlijk moeizaam verloopt, dus niet handig. Wanneer bepaalde mannen eindelijk hun machtspositie hebben veroverd blijven ze daar het liefst zo lang mogelijk zitten, voor hun aanzien en eigenbelang. Niks voor de uitkomst van een proces waar ze in hun positie onderdeel van zijn, dat komt op de tweede plaats. Het is tijd dat (hoog-)volwassen mannen in grijze pakken hun ego wat opzij schuiven en ruimte creëren voor jongere mensen met snelle, frisse, optimistische blik en vrouwen met de nodige kwaliteiten als zorgzaamheid, verantwoordelijkheid, menselijkheid, compassie, empathie, gevoel, verbondenheid, etc. Daarbij: “One half of the world is women, the other half is young people – the ones who women have given birth to.” Maar het zijn de oude mannen die aan de macht zijn en beslissingen voor de toekomst maken – hoe kan dat ooit een eerlijke balans zijn die voor noodzakelijke uitkomsten zorgt!? Niet! Al met al: power to the people, power to the women, power to the young. Samen maken we alle verschil. Het is tijd om te verbinden en te vernieuwen: in de economie, in de VN, en in ons eigen leven. Jongerenperspectief op VN klimaattop – wat gebeurde er nou echt (niet) & hoe nu verder? Zondagavond, in de trein terug uit Warschau, Polen. Dit was een strategische keuze: de VN-klimaatonderhandelingen zouden zoals altijd op vrijdagavond eindigen, maar iedereen weet dat dat het weekend erna betekent in de taal van klimaatonderhandelaars. En zo was het ook; op zaterdagavond 9 uur was de “Warsaw Outcome” rond. Wat is er gebeurd? Te weinig. Niet niks. Op de kernonderwerpen ADP (waar in 2015 een nieuw klimaatverdrag – opvolger van Kyoto Protocol – uit moet komen), loss & damage (hoe maken we landen weerbaar voor de gevolgen van klimaatverandering vandaag; hoe kunnen zij wel of niet gecompenseerd worden voor schade en verlies hierdoor?) en finance (duidelijk: geld voor aanpak klimaatverandering), is consensus gevonden. Vrijdagnacht en zaterdagmiddag stond men vaak nog lijnrecht tegenover elkaar en kwamen dan samen in zogenaamde “huddles” (agglomeraties van onderhandelaars en/of ministers met in het midden de hoofdspelers – over het algemeen de VS, BASIC-landen, soms EU, en vrijwel altijd Venezuela) – waar ik zo nu en dan ook even mijn oor in stak – om een middenweg te vinden (dat is: andere woorden voor in de tekst). En een fatsoenlijk bedrag ($ 280 miljoen) voor tegengaan van ontbossing, dit laatste als een van de enige echte – kleine – successen. Oplossing voor klimaatverandering? Nee, niet hier. De VN “dat zijn wij” (in essentie), en het belangrijkste is dat in alle landen mensen aan de slag gaan en klimaatverandering in praktijk wordt tegengegaan. Dat kan (en zal moeten) enerzijds door de mensen zelf, in ons eigen huis, bij het maken van aankoopbeslissingen, door actief met duurzaamheid bezig te gaan in je werk, enzovoorts, en vooral ook door mensen in de mediawereld die burgers zou moeten blijven informeren over en activeren voor klimaatverandering. Anderzijds kan dat (en zal dat zeker moeten) door onze regering de goede kant op te sturen. Druk te zetten op Rutte en zijn ministers en staatssecretarissen om klimaatverandering en duurzaamheid bijzonder serieus te nemen, als integraal onderdeel van (economisch) beleid, zodat Nederland op het internationale toneel met een ambitieus mandaat kan meedoen. Dat is nodig bij VN-toppen, maar voornamelijk ook bij alle voorafgaande EU-meetings, want internationaal neemt Nederland alleen als EU zijnde het woord (over het algemeen dus niet). Een belangrijk moment om in de gaten te houden (en vooral: OM DRUK TE ZETTEN OP ONZE REGERING) is begin 2014; voor maart zal de EU haar klimaatambities voor 2030 vastleggen. Dat zal meegaan naar de Leaders Summit over klimaatverandering van VN Secretaris-Generaal Ban Ki-moon in september 2014, en naar de volgende klimaattoppen in Lima (Peru) en Parijs (Frankrijk), op naar een nieuw, hopelijk ambitieus genoeg verdrag om jouw en mijn toekomstige (klein)kinderen een veilig leven te kunnen garanderen. Maar dat is zeker ook afhankelijk van mij en jou, NU. Twee weken geleden kwamen we terug uit New York, waar Ties en ik als Nederlandse Jongerenvertegenwoordigers Duurzame Ontwikkeling de opening van de Algemene Vergadering van de VN – die in het teken stond van de post-2015 agenda – bijwoonden. Om half 8 ‘s ochtends kwamen we aan op Schiphol, om 9 uur zat ik alweer in college; helaas heel kenmerkend voor de afgelopen twee weken, vol met slapeloze nachten, vergemakkelijkt door de instandhouding van mijn jetlag, en talloze studiedeadlines, en dat samengenomen met een agenda die ook nog gewoon volstaat met lezingen en gastlessen door het hele land. Vandaar dat er voor ons nu pas tijd begint te komen om te reflecteren – en dus ook deze blog te tikken – over wat we nou eigenlijk precies hebben gedaan en bereikt, en natuurlijk vooral ook de follow-up: wat ons nu allemaal te doen staat. Het heeft een lange tijd geduurd voor we besloten ons ticket naar New York voor de AVVN te boeken. Het gaat toch wel om een hele hoop CO2, en ik wil er altijd zeer zeker van zijn dat onze reis voldoende (postitieve) impact heeft. Belangrijke vergaderingen voor post-2015 en duurzame ontwikkeling stonden op de agenda, maar voor de zoveelste keer mochten we in de eerste instantie niet mee als leden van de officiële delegatie. En dat terwijl zelfs Rutte op de hoogte was van onze reis, die we bij terugkomst ook verslag zullen gaan doen (waar hij zelf om heeft gevraagd!). Wisten jullie trouwens dat Rutte ooit heeft gesolliciteerd voor deze functie, maar het zelf niet is geworden? Er is dus hoop voor ons. Maargoed, de delegatie moest dit jaar zoals bijna elke VN-conferentie zo klein mogelijk blijven, dus in principe konden wij niet mee. Maar dat zou weer helemaal nergens op slaan, omdat wij officieel verkozen zijn om de stem van de Nederlandse jongeren bij de VN te vertegenwoordigen. Bovendien hoeft de overheid geen cent aan ons te besteden, dat regelen we allemaal zelf, via NJR en de ASN Bank. En de delegatie moet vooral klein zijn vanwege de kosten dat het allemaal met zich meebrengt. Ik had ondertussen al wel een vol programma voor ons bezoek in elkaar gedraaid, ons waar mogelijk dan maar aangemeld als NGO, en via allerlei mogelijke manieren hebben we toch aan de kaak gesteld dat we eigenlijk gewoon mee zouden moeten in de delegatie. We hadden namelijk een ‘nee’, maar doordat ik bleef proberen werd het proces toch opnieuw in gang gezet (o.a. door wat hogere bazen die vonden wat we gewoon mee moesten kunnen). Toen hebben we maar besloten om het erop te wagen en onze tickets geboekt. De vrijdag voor vertrek kreeg ik pas het bijna-beslissende telefoontje van Buitenlandse Zaken. “Nou Ralien, ik heb je naam deze afgelopen weken wel 60x langs zien komen over de mail, en ik heb nu toch goed nieuws voor jullie. Alleen Frans Timmermans moet het nog even goedkeuren…” Dat was dus zo goed als rond. Man, wat was ik blij! We waren in New York. Dat is geweldig. Maar het was zeker niet makkelijk om er te komen. Ik hoop dat dit in het vervolg, waaronder bij mijn opvolgers, echt wat gemakkelijker gaat. Want het is toch jammer dat het steeds zo moeilijk moet, terwijl na afloop iedereen altijd blij lijkt te zijn met de beslissing om ons in de delegatie toe te laten. Maar het is voor nu gelukt: we konden er dus helemaal voor gaan. We hebben er dan ook alles uit proberen te halen wat erin zat. We waren als Jongerenvertegenwoordigers Duurzame Ontwikkeling naar de opening van de 68e AVVN. Bizar om daar – waar op dat moment bijna alle wereldleiders maar tegelijk ook CEO’s en allerlei andere bekende figuren rondlopen – aanwezig te mogen zijn. Wat hebben we precies gedaan? De eerste dagen & heel veel jongerenvoorbereidingen! Vrijdag Om 7.30 waren we op de missie voor een werkontbijt over Food & Nutrition Security. Met allerlei hoge diplomaten maar ook mensen als Paul Polman, de CEO van Unilever. Wij werden geïnstrueerd om op de tweede rij plaats te nemen (niet aan tafel) omdat het erg druk was. Uiteindelijk waren er nog wel plekken aan tafel, dus Polman draait zich naar ons om – terwijl de meeting al is begonnen – en wijst “Kom op jongens, ga aan tafel zitten. Ik wil dat jullie daar gaan zitten. Kom op, toe maar, er is plek. Ik wil dat de jongeren ook een plek krijgen, jullie horen daar, dus ga aan tafel zitten!” Hij bleef omgedraaid zitten, wat natuurlijk niet kon, dus ja hoor, wij staan op en verplaatsen ons met lichtgebogen hoofd naar het uiteinde van de tafel, waar we plaatsnemen. Dat gaf een mooi signaal af. Polman is een held. Nog mooier was dat ik opeens ook naast Csaba Korosi bleek te zitten, PV van Hongarije en daarnaast co-chair van de Open Working Group on Sustainable Development Goals (OWG SDG) waar ik in juni heen was. Daar hebben we – ondanks zijn overvolle agenda – meteen een afspraak mee weten in te plannen in de daaropvolgende week. Super, want hij is een van de key persons als het gaat om het proces naar de nieuwe ontwikkelingsagenda! Oorspronkelijk zijn wij jongerenvertegenwoordigers naar de VN-commissie voor duurzame ontwikkeling (CSD). Op vrijdag hebben we de begrafenis van deze commissie mogen bijwonen; CSD20. In Rio is namelijk besloten dat we voor duurzame ontwikkeling bij de VN een zogenaamd High Level Political Forum (HLPF) onder de UNGA zullen krijgen, waarvan de eerste sessie op dinsdag tijdens de ministeriële week zal plaatsvinden. De CSD wordt dus opgeheven. Omdat het behoorlijk saai is – woorden, woorden, woorden – zit ik lekker te Twitteren en zie ik opeens dat Peter Bakker (President van de World Business Council on Sustainable Development) ook in the city is. Ik stuur hem een berichtje, en krijg terug: “Hebben jullie tijd voor lunch straks?” Dus wij vertrekken wat eerder uit deze laatste CSD (vaarwel, commissie!) en hebben tijdens de lunch een behoorlijk diepgaand gesprek over verandering, bedrijfsleven, jongeren en samenwerking. Het is goed dat we elkaar op de komende klimaattop weer zullen zien. Die middag komen de internationale jongeren bijeen om te werken aan de jongereninzet in de VN-processen. Goed om iedereen weer te zien, danwel te leren kennen, maar er komt niet veel concreets uit om eerlijk te zijn. Dat heeft vooral te maken met het feit dat bijna geen van deze jongeren naar binnen kunnen. Ontzettend zonde. We doen ons best er wat van te maken en plannen de rest van het weekend vol met vervolgmeetings met de jongeren (vooral de delegates) om inhoud en strategie voor komende week verder uit te werken. Zaterdag & zondag Op zaterdag hebben we koffie gedronken met Harry Verhaar, een goede kennis van Philips, en Maurits Groen & Camille van Gestel, van de WakaWaka. Twee behoorlijk inspirerende gesprekken. De fantastische WakaWakaPower nemen we mee om bij de VN het voorbeeld mee te zetten. Harry zien we gelukkig ook weer op de klimaattop in Polen, waar hij graag weer met ons wil samenwerken (en wij ook met hem!). De rest van de zaterdag en na nog een bijeenkomst bij de VN ook de zondag besteden we aan het op een lijn komen met de internationale jongeren, zodat we duidelijk hebben waar we deze high-level week op gaan inzetten. Na uren discussie en samenwerking komen we eruit. Hier de onepager waar wij vanaf morgenvroeg de VN mee gaan bestormen, voor equity, planetary boundaries & youth participation. Maandag begint het echte circus. Dit heb ik nog nooit gezien. Rio was al bizar, maar hoeveel beveiliging en glimmende zwarte auto’s ze hier uit de kast hebben getrokken slaat echt alles. Voordat we naar de VN toegaan bezoeken we eerst de Ierse missie, daar vindt namelijk de jaarlijkse sessie van de Troika+ van Women Leaders plaats, georganiseerd door de Mary Robinson Foundation for Climate Justice, en wij zijn uitgenodigd om de internationale jongeren te vertegenwoordigen. Samen spreken we over het thema intergenerational equity, gelijkheid tussen generaties waar het gaat om klimaatverandering en voornamelijk de effecten daarvan. Een bijzonder goede meeting met key players uit de klimaatonderhandelingen (allerlei ministers, waaronder de Poolse), de EU Commissioner for Climate Action, die namens de EU onderhandelingen leidt, Christiana Figueres, Executive Secretary van de VN-klimaatonderhandelingen, de chair van UN-Women, en Mary Robinson herself (oud-premier van Ierland). Hier is een informele werkgroep gestart met al deze Women Leaders, en de internationale jongeren. Dat hebben we mooi voor elkaar! Wij zullen het contact coördineren en zien elkaar opnieuw, in onze zojuist opgestelde werkgroep, en tijdens een high level event over intergenerational equity, bij de VN-klimaattop. Wij zijn deze dag bij het MDG Success Event, om van te leren maar ook om waar mogelijk tussen de eindeloze lijst high-level sprekers (Ban Ki-moon, Paul Polman, Jim Yong Kim, Bill Gates, Sheryl Sandberg, wie niet?) een minuutje de microfoon te grijpen (dat is gelukt!). Tussendoor is ook een NGO-briefing van minister Ploumen, die we later deze week nog persoonlijk zullen spreken. Super dat ze daar tijd voor wil maken! Dinsdag staat in het teken van het High Level Political Forum (HLPF), de opvolger van de VN-commissie voor duurzame ontwikkeling. Ons statement ligt strategisch bij de in- & uitgang (helaas mochten we ze niet op elke tafel leggen) dus iedereen die daarlangs komt neemt met alle papieren ook onze boodschap mee. Dat werkte behoorlijk. Nederland heeft helaas maar twee plekken, en als NGO kon je al helemaal niet naar binnen (belachelijk), dus we hebben pech. Dat vonden we wel heel erg jammer, dus toen we binnen waren om ons statement neer te leggen zijn we (stiekem) door naar boven gelopen – ondertussen liepen we IMF-baas Lagarde nog tegen het lijf, die we natuurlijk ook hebben aangesproken – en namen we plaats op de achterste stoeltjes. Eigenlijk best wel erg, maarja, het was gewoon te belangrijk voor ons om deze meeting te kunnen meemaken. Niet dat er uiteindelijk veel is gebeurd, om eerlijk te zijn, het waren voornamelijk prachtige woorden. Bij VN-meetings is het meestal ook zo dat het aan het begin overvol is (althans, dat was bij het HLPF zo, en dat is best een goed teken) maar al snel stroomt het leeg. Nadat Nederland aan de beurt was geweest (de minister-president van Curacao sprak namens het Koninkrijk der Nederlanden – Rutte zou niet durven) kregen Ties en ik dan ook de twee toegangskaarten en konden we wel legaal de bijeenkomst bijwonen. Zoals het hoort, heb ik tussendoor – op de daarvoor bedoelde stoeltjes in de wandelgangen – een goede meeting gehad met de vertegenwoordiger van het Verenigd Koninkrijk, waar we nauw mee moeten samenwerken als Nederland in de Open Working Group voor SDGs, en heeft Ties om tafel gezeten met de EU Commissioner for Environment (Potocnik), samen met wat andere jongeren en stakeholders. Met beiden is over ambitie, de drie prioriteiten, en het actief betrekken van jongeren in de processen gesproken. Dat was top! Woensdag 25 september was de dag waar bij veel post-2015 discussies al naar werd verwezen. Het MDG Special Event vond namelijk plaats. Omdat wij ons in de periode voor NYC voor de zekerheid maar hadden geregistreerd als NGO’s, kon een van ons erbij zijn. Tijdens dit event zou de weg vooruit worden bepaald voor de post-2015 agenda. Want zelfs over proces was nog geen consensus. Voordat ik de Trusteeship Council inging voor het event, liep ik nog even snel naar de WC. Stond ik voor de spiegel bij de wastafel, en kijk ik naar rechts, staat opeens DE KONINGIN naast me. Ik schrok me rot! Wist niet zo goed wat ik moest zeggen, dus het zal wel wat doms zijn geweest, maar ik sprak haar aan en we hebben het vervolgens even over de AVVN, duurzaamheid, en jongeren gehad. Helaas had ze geen tijd meer voor een afspraak met jongeren, want ze vloog die avond al terug, maar omdat ze dat vroeg doe ik bij deze de Nederlandse jongeren namens haar de groeten (ga zo door met duurzaamheid)! Toen we richting de deur liepen komt minister Ploumen opeens ook binnenvallen! Wat een gekte op het damestoilet! Ik zal maar niet vertellen wat ze met elkaar bespraken, want dat is niet relevant, maar het was wel echt prachtig toeval. Die dag bracht ik dus voornamelijk door bij het MDG Event, waar gelukkig is besloten dat we hoogstwaarschijnlijk een nieuwe set doelen voor de wereld gaan ontwikkelen, waar zowel milieu als sociaal samenkomt. Dat is heel erg fijn! Verder was er nog John Kerry (US Secretary of State) die tijdens zijn vreselijk Amerikaans-retorische statement bij zijn punt over “er zijn nog mensen die zonder energie zitten en daar moeten we echt wat aan doen” het licht liet uitvallen (nee, dat kan geen toeval zijn geweest, het is een Amerikaan), wat voor de nodige schrik en hilariteit zorgde. Maar toen de belangrijkste speeches waren geweest en het outcome document was goedgekeurd, werd het ook bij dit event langzaamaan rustiger. Ondertussen was ik druk aan het bellen met de secretaresses van de Hongaarse co-chair van de Open Working Group (wiens werk ook door de beslissingen bij het MDG Special Event belangrijker is geworden) en uiteindelijk hebben we daar – wederom in de wandelgangen – een half uur mee gesproken, over hoe wij de OWG als jongeren kunnen helpen en van waardevolle input kunnen voorzien. Hij herinnerde zich dat bij de vorige meeting “there was a young woman who turned the whole audience around with her statement” dus hij adviseerde me ook vooral om te blijven komen! =) Vlak voor deze afspraak met Korosi kreeg Ties een telefoontje van de PA van Ploumen, of we konden meeten, en dit is heel erg, maar we hebben de minister dus moeten afwijzen. Dat geloof je toch niet. Stelletje snotneuzen die niet kunnen afspreken met de minister omdat ze een andere afspraak hebben. Gelukkig hebben we daar die middag nog een momentje voor gevonden. Want na het MDG Special Event hield Nederland een receptie ter ere van de opening van de vernieuwde Delegates’ Lounge (waar NL voor heeft gezorgd) met daarbij onder andere UNSG Ban Ki-moon (we konden hem helaas niet aanspreken vanwege de 5 beveiligers om hem heen, maar gaf ons wel een bemoedigend knikje! ), Koningin Maxima, minister Timmermans & minister Ploumen. Best wel gaaf! Na alle mooie openingsstatements hebben we nog heel goed met de PA van de Koningin gesproken, een ontzettend leuke vrouw, die in de toekomst ook graag wat met ons wilde als we met een goed plan komen. Ook hebben we ons gesprekje met Ploumen gehad, wat echt super was. We hebben verslag gedaan van onze ervaringen bij de AVVN en vooral ook wat we wat minder leuk vonden. Zo vertelden we haar onder andere dat er amper officiële jongerenvertegenwoordigers in delegaties zijn, en daarvan zijn het ook nog eens voornamelijk de ontwikkelde landen, wat dus echt niet goed is voor een juiste vertegenwoordiging van de jongeren van de wereld. Dat vond Ploumen zelf ook, dus zij wil daar wel naar gaan kijken, en met overheden van ontwikkelingslanden hierover spreken, om ze aan te moedigen jongeren ook een stem te geven. Verder zullen we elkaar vast weer zien in Nederland om verder te spreken over hoe de post-2015 agenda dichter bij de Nederlanders, zowel jong als oud, te brengen. Tussen alle bedrijven door zijn we trouwens ook nog naar de andere kant van New York geracet om met John Podesta (een van de leden van Ban Ki-moon’s High Level Panel on Post-2015 Development) te spreken, samen met een groep jongeren, omdat hij het voorstel heeft gedaan voor een Youth High Level Panel. Natuurlijk doen wij alles om de jongerenstem goed hoorbaar te maken binnen de VN, wat niet altijd zo makkelijk is, maar we wilden hier wel even goed over praten omdat o.a. het high level aspect ons niet zo aansprak. Het was een goed gesprek, maar ik vraag me erg af wat er nu wel en niet gaat gebeuren. Daar gaan we dus nog achteraan. In ieder geval loopt de lobby voor een veel permanentere stem van jongeren middels een UN Permanent Forum on Youth momenteel erg goed! Donderdag was iets rustiger wat VN-processen betreft, dus we zijn vooral naar wat relevante side-events geweest. Noemenswaardig was een event over ‘Fulfilling the Rio+20 promises’ wat mede-georganiseerd was door wat jongerencollega’s van ons die bij NRDC (National Resource Defense Council) ofwel Stakeholder Forum werken. Ontzettend belangrijk, want wat gebeurt er nou eigenlijk echt als er dingen worden gezegd en afgesproken op een conferentie? Wordt het ook nageleeft? Voor wie benieuwd is naar de resultaten, het rapport is hier te downloaden. In Rio heb ik destijds met Liset ook zogenaamde Oprechtheidsverklaringen laten tekenen door de Nederlandse vertegenwoordigers, dus wellicht ook iets voor ons om weer eens achteraan te gaan. Hoe staat het ervoor in Nederland? Wat doen we om doelen te bereiken (en wat niet)? Ties heeft de data over Nederland opgevraagd, dus als die binnen zijn kunnen we daar wellicht met de werkgroep mee aan de slag. Be prepared! Vrijdag ‘s Ochtends hadden we een hele bijzondere koffieafspraak, namelijk met Jorge Laguna Celis, de senior adviseur duurzame ontwikkeling voor de PGA, de President van de AVVN (een van de afspraken die Rio-delegatieleider Kitty vanuit Nederland voor ons had gefixt, geweldig). Een uur lang hebben we samen koffie gedronken en gesproken over duurzame ontwikkeling en jongeren in de post-2015 agenda. Hij gaf ons heel wat aanknopingspunten om verder over mee te denken, zeker omdat de PGA zelf ook zoekende is naar hoe de jongeren erbij te betrekken. Daar willen wij zeker wel bij helpen! 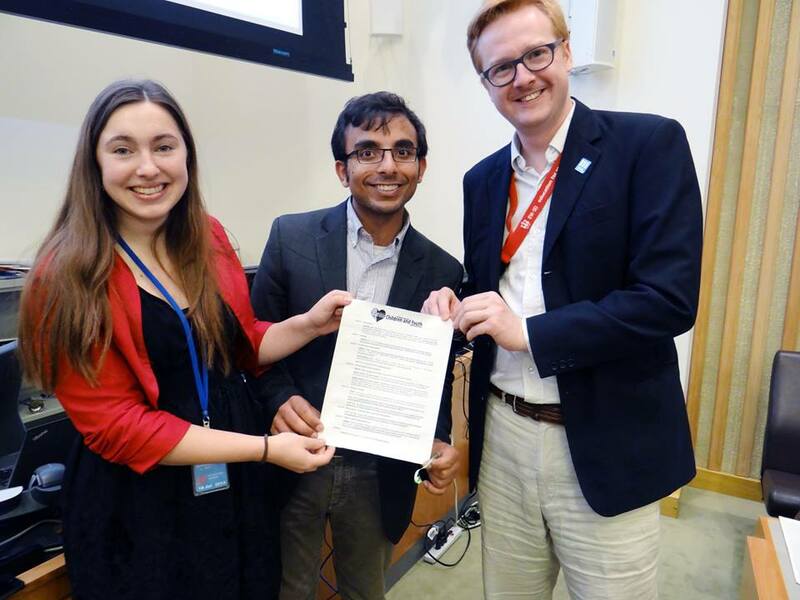 Ook hebben we het gehad over mogelijkheden voor het Permanent Forum on Youth, danwel andere structurelere opties, en daar kwam meteen weer een nieuwe afspraak met hem en mensen van ECOSOC (Economic & Social Council) uit voort. We zullen zeker nauw contact met elkaar houden! Ondertussen is het alweer drie weken voordat we naar de VN-klimaattop in Warschau, Polen vertrekken. Komend weekend zullen we in Brussel met de Europese jongerenvertegenwoordigers voorbereiden. Gelukkig hebben we in New York – vaak toevallig – ook al heel wat voorwerk kunnen doen. 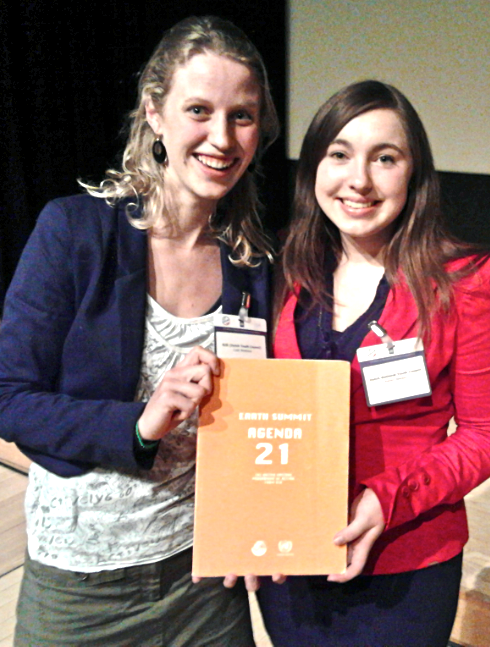 We gaan aan de slag met Intergenerational Equity, samen met de jongeren en de geweldige groep Women Leaders. We zullen kijken hoe we wederom de handen ineen kunnen slaan met het bedrijfsleven, waaronder de World Business Council on Sustainable Development. Ook zullen we de campagne “I am part of the solution” die vorig jaar door ons samen met de internationale jongeren is gestart voortzetten. De komende weken staan nog vele gastlessen – van universiteit tot aan basisschool – op de planning, om input te verzamelen die we kunnen meenemen naar Polen, en die we onder andere aan staatssecretaris Mansveld zullen overbrengen. Naast al dit, wordt het voor mij vooral ook heel spannend om me weer tussen deze behoorlijk negatieve en activistische jongeren te bevinden. Voor wie mij vorig jaar na de COP in Qatar heeft gesproken: dat was absoluut geen pretje. Een dag nadat we vorig jaar terugkwamen heb ik daarover verteld tijdens mijn speech op de Nacht van de Nieuwe Macht. Ik kan me nog steeds zo ontzettend boos maken over wat daar is gebeurd met de Noord-Amerikaanse jongeren. Maar ik ga daar geen bakken met negatieve energie meer aan verspillen. We hebben op allerlei manieren geprobeerd (ook nog maanden na de conferentie) wederzijds begrip te realiseren, maar deze mensen staan voor niks anders open dan voor zichzelf en hun eigen ideeën. Ook heb ik me echt gerealiseerd dat ook wij (en dan vooral ik) zijn doorgeslagen wat betreft het drama dat we ervan hebben gemaakt. Ook dat heeft andere jongeren waarschijnlijk negatief beïnvloed, en dat spijt mij heel erg, want dat staat lijnrecht tegenover mijn doelen. We hadden al die negativiteit en de onwil vanuit de Noord-Amerikanen ook meteen naast ons neer kunnen leggen. Ik zal me dit jaar op de achtergrond houden, en daar werken aan meer inclusiviteit van de internationale jongerengroep; ruimte maken voor minder ervaren jongeren en voor die met een minder harde stem. Want al zal ik het gevecht niet meer publiekelijk aangaan; ik sta niet toe dat Noord-Amerika de boel bij de jongeren domineert. Dat is zo grijze pakken-generatie. Dus ik ga er alles aan doen om de jongeren uit de ontwikkelingslanden tijdens de COP een luide stem te geven, iets wat heel hard nodig is! Last week I told my little brother that I would be far away from home for a conference about the future. “Can I please come with you?” he directly asked me. It struck me as a quite logical question. After all, it is his future too, isn’t it? I explained how I would do the work for him this time. More importantly, I promised him that there would be a room filled with very important and intelligent people that would also have his best interests, and those of all other families around the world, at heart. Isn’t it actually strange that we are discussing youth here, without hardly any youth present in the room? That we are deciding about the future, without future generations being part of these discussions? It is good to talk about young people, but it is much more powerful and meaningful to talk with young people. You will then find that young people share many of your concerns. And better, that we often have a clear view on how to achieve improvements. I am going to ask you urgently to give your attention to youth priorities such as education and employment, equality and good governance. They are high ranking on the younger generation’s agendas. In an ideal world we should not have to ask for help. But reality is, that many legal, policy and regulatory barriers hinder the meaningful participation and empowerment of young people to exercise and claim their rights. We must however put young people at the center of the design, implementation and monitoring of the future goals. Meanwhile, I am most thankful to the governments of Australia, the Netherlands and the UK for the opportunity to speak. Although this statement does not represent the governments of the countries, it does represent the voices of their youth. But it also includes the ideas of tens of other young people from around the world, since they were actively involved in the open writing process of this speech. In doing so, something became perfectly clear. We, as people, despite our differences and diverse cultures, should work together as one. We have to make sure that all cultures, all ages and all differences between people are recognized in the goals. Diversity is not a weakness, it is our strength. Youth is demonstrating it by working together, transcending national boundaries. Over and over again, our work results in common statements and solutions. It is possible. We support strong and ambitious SDGs that not only promote a sustainable and safe world, but also tackle the problems that get in the way. I’m speaking of economic inequality and youth unemployment, weak governance structures, natural resource inefficiency and violations of human rights. Recently, the High Level Panel did a good job putting young people at the center of the discussions but still needs to incorporate more youth focused indicators. We feel that the report provides a baseline for strong SDGs but should build on the work done by others including the Commonwealth Youth Development Index and the Major Group of Children and Youth in creating goals and targets, disaggregating data, and we should even consider a youth specific goal. In addition, we must rethink the way that we approach development. We call on Member States to work towards a holistic approach, defining “well-being” that incorporates environmental and social considerations, beyond the economic focus of GDP. First, the fast increasing numbers of youth unemployment are of major concern. We as youth should be educated to tackle current and future challenges. We must be equipped with new and sustainable skills that prepare for work. Not to search desperately, in some cases even for years, for a low quality job. Investment in quality education is of high priority and generates immediate and intergenerational paybacks. But only if governments prioritize creation of green and decent jobs, building a sustainably skilled workforce by increased investment, together with private sector, in order to enhance national ecosystems for youth enterprise. Second, the new framework should make an explicit commitment to the meaningful inclusion of the most vulnerable and marginalized groups. We must remove the barriers they face for accessing basic services, economic opportunities, political representation, and human rights. Supporting equal opportunities and reducing social inequalities will lead to more sustainable societies. Investing in girls, for instance, is one of the single most effective interventions for reducing poverty. SDGs should ensure girls’ access to education and health services, including sexual and reproductive health and rights, and promoting policies that empower their role in society. And third, fair, responsive and accountable governance is among top priorities of young people around the world. We vow for a world where decision-makers have integrity, responsibility and are held to account. A world where governance systems are designed to take courageous decisions for long-term benefit. Truth is, nowadays many young people feel disempowered by the systems that are supposed to represent them. This creates distrust, which should be actively avoided. Let’s face it: you do not only need us for designing these goals, but you will need us all the more to achieve them by 2030. Unfortunately, none of the young people I spoke with in my country knew about this very “far away” process. Therefore we would like you to think of a way how to make sure that all children and youth around the world learn about and know the SDGs from 2015 onwards, and feel like they are part of it. You can start now. Talk, listen and work together with us for the challenges of our futures. Here at the UN, and back at home. We must become partners and allies for sustainable development. The nuanced perspectives of youth on these issues can provide new solutions and mobilize youth as assets and problem solvers. There is so much potential. Do you know that an Indian teen girl recently developed a super energy efficient 20-second cell phone charger? That a high school student in the USA designed the fastest and cheapest cancer detector ever? And that a 19-year-old boy from the Netherlands created a system to clean the plastic soup in the oceans? Also, Bill Gates & Steve Jobs created revolutionary innovations when they were only 21. Without these young ideas, we would never be where we are today. Youth innovations should play a prominent role in the new development framework. But it really is your task to stimulate and empower all of us, in order to become part of the solution. Only when we succeed in forming intergenerational partnerships right now, focusing on intergenerational equity and solidarity, we have a chance on real and long-term success. Ladies and gentlemen, way more important than all the beautiful words are the actions that should follow from them. All young people, and families around the world, count on you and your actions. We look forward to actively working with you, to create and achieve the goals for our common, sustainable future. Because not only youth, but a partnership of generations, will be part of the solution. You can watch the statement on UN Web TV (starts at 39 minutes): http://webtv.un.org/watch/3rd-meeting-4th-session-of-the-open-working-group-on-sustainable-development-goals-17-19-june-2013/2487687710001/ (also see the reactions of the co-chair and next speaker, India). En dat is precies wat we ze hebben gegeven. Rio+20. Zo lang naartoe gewerkt, zo’n belangrijk moment voor onze gemeenschappelijke toekomst en zo ontzettend spannend: mijn eerste echte VN-conferentie. Rio+20 was een conferentie die in het officiële gedeelte van de onderhandelingen ontbrak aan energie en politieke wil, maar daarentegen barstte van een grote hoeveelheid eigenbelang. Niet iets waar wij jongeren op hadden gehoopt, en al helemaal niet de juiste instelling om “de wereld mee te redden”. Vanaf dag één werd al duidelijk dat we dit spelletje heel anders en vooral héél slim moesten gaan meespelen. Dat hebben we natuurlijk gedaan. Op wonderbaarlijke wijze (of: door alle aanwezige internationale jongeren te mobiliseren, keihard en ijzersterk te lobbyen en in een paar kostbare uren alle 197 landen achter ons te krijgen) hebben we het voor elkaar weten te krijgen om een nieuwe paragraaf over onderwijs aan de eindtekst van Rio+20 toe te voegen. Hierin staat het belang van non-formele educatie voor bewustwording van jongeren en duurzame ontwikkeling. Dat zijn de dingen buiten het klaslokaal, die ook bijdragen aan de vorming van een persoon. Voor ons als jongeren op deze conferentie was dit een fantastisch en ontzettend bijzonder resultaat: het is namelijk nogal ondenkbaar dat er in zo’n laat stadium (de onderhandelingen waren al langer dan een jaar bezig) van een bureaucratisch VN-proces nog een hele nieuwe paragraaf bijkomt. Meestal proberen ze juist zoveel mogelijk tekst (= beloftes) te verwijderen… Best wel ongelofelijk dus. Een prachtig en heel gewenst resultaat. Dit was een van onze jongerensuccessen, maar over het algemeen was het toch een hele vreemde conferentie. Na de voorbereidende onderhandelingen besloot Brazilië ineens dat het zo niet werkte (ze hadden een punt, want slechts 1/3 van de tekst was toen goedgekeurd) en nam de gehele conferentie over. Zij hebben vervolgens alles geleid, een nieuw document geïntroduceerd, en deze er met alle (soms heel manipulatieve) middelen doorheen weten te drukken. Inhoudelijk verlies voor de EU, door gebrek aan ambitie en concrete afspraken, meer in het voordeel van de G77, VS en Canada die het liefst zo weinig mogelijk commitments uit Rio+20 wilden halen. De eindtekst lag uiteindelijk klaar op de dag voordat de High Level Days begonnen – dat is wanneer alle regeringsleiders en staatshoofden worden ingevlogen – en zo kwam het er eigenlijk op neer dat al deze wereldleiders niks hebben bijgedragen aan de uiteindelijke inhoud van de uitkomst van de conferentie. Dat voelt toch wel raar. Meer dan raar: het zorgt ervoor dat ik als jongere een deel van mijn vertrouwen verlies, ook in degenen die vandaag de dag deze wereld “leiden”. Ik mag hopen dat we hier in de toekomst grote shifts in zullen zien. Rio+20 was overweldigend, een (emotionele) rollercoaster, deels teleurstellend en zeer frustrerend, maar ook verrassend. Liset (mijn collega-jongerenvertegenwoordiger) en ik hebben dingen kunnen doen en bereiken, waar we van te voren niet eens aan hebben kunnen denken en absoluut niet van hadden durven dromen. Naast onze effectieve lobby, hebben we ons als officiële leden van de Nederlandse Koninkrijksdelegatie bewezen serieus te zijn en goed werk te leveren. Waar sommige collega-delegatieleden in het begin zeer sceptisch over ons waren, gingen we aan het eind van de rit uit elkaar als een geweldig en sterk team, met wederzijds torenhoog respect. Voor mij kwam het toppunt van de conferentie totaal onverwachts. 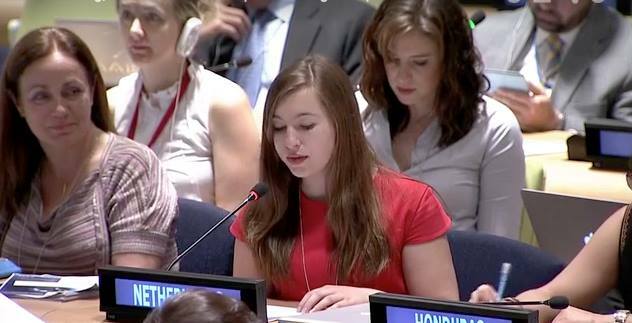 Ik kreeg opeens te horen dat ik door de internationale jongeren naar voren was geschoven om een speech te geven op een High Level Event. Toen mij dit doodleuk werd verteld, voegden ze er nog even snel aan toe: “Je begrijpt dus dat dit met VN Secretaris-Generaal Ban Ki-moon is?” Een paar keer knipperde ik met mijn ogen, kneep even in mijn eigen arm, mond ondertussen uiteraard half-open gezakt: “Ehh, yeah sure?” En zo moest ik één dag van tevoren urenlang door de VN gebriefd worden, waar bleek dat het over een event ging met topeconoom Jeffrey Sachs, CNN-oprichter Ted Turner, Nobelprijswinnaar Muhammad Yunus en nog een aantal andere bazen. En daartussen nam ik dan plaats als zogenaamde “youth leader”. Na een nacht met maar liefst 1 uur slaap zat ik daar opeens, direct NAAST Ban Ki-moon nog wel, en werd mij gevraagd direct NA Ban Ki-moon te spreken (omdat de secretaris-generaal daar zelf om had gevraagd), heb ik alles maar over me heen laten komen en – waarschijnlijk omdat ik door de moeheid niet zo hyperenergiek als gewoonlijk was – op mijn dooie gemakje mijn speech voorgedragen. Naast het geven van mijn visie op het belang van betrekken van jongeren waar het gaat om ontwikkeling, onze toekomst en innovatie (waar wij ontzettend veel potentie hebben en voor oplossingen kunnen zorgen) nam ik ook lekker even mijn moment om te reflecteren op de uitkomst van Rio+20. Daarover zei ik dat ik namens de jongeren enorm teleurgesteld ben, dat wij ons alles behalve gehoord voelen en dat wij op zo’n manier ons vertrouwen verliezen. Het ergste wat er is, maar wel een ontzettend harde waarheid. Dat leverde me een stevige handdruk en de complimenten van een trotse Ban Ki-moon op. Wauw. Het laatste wat ik nog wil meegeven is de uiteindelijke boodschap voor Nederland vanuit Rio. We hebben deze gemeenschappelijk visiedocumenten en internationale verdragen hard nodig, maar ze redden de wereld (tot nog toe) zeker niet. De uitvoering gebeurt hier, voor ons op deze Hollandse bodem, en daar zijn we allemaal onderdeel van. Wacht niet op de politiek, maar vraag om echte verandering. Wacht niet op een ander, maar begin zelf. Kansen zijn talrijker dan ooit. Om met een zojuist opgevangen quote te eindigen: “Duurzaamheid is het geitenwollensokken-tijdperk definitief uit – het is nu big business.” En zowel de mens, als de aarde, als de economie zal eraan verdienen. Onderweg naar het World Forum in Den Haag bleek ik gelukkig niet de enige jongere te zijn die ervan op de hoogte is en die vindt dat het tijd is voor actie in de taxi. Vlak voor de deur een groep Greenpeace-jongeren (incl. een studiegenootje van mij, de twintigjarige Marloes, superleuk) die hun standpunt uitdroegen, inclusief het fameuze Christus-standbeeld uit Rio. 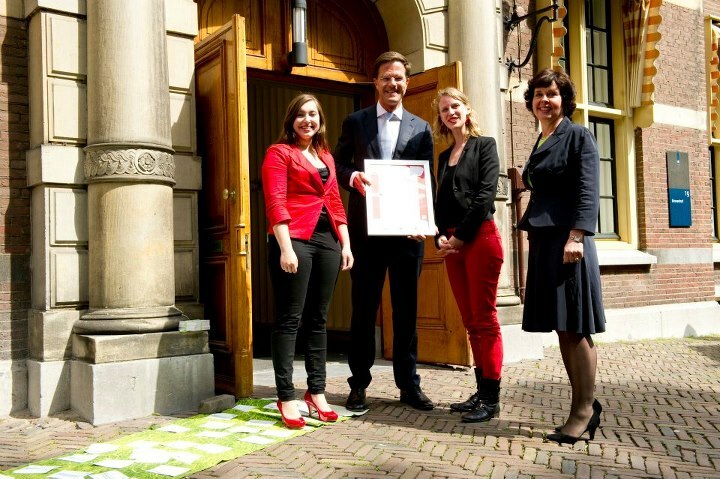 “Twintigers willen groene VN-top Rio+20”. Na twee duimen op te hebben gestoken, haastte ik me snel naar binnen, waar de inside scoop van start ging. Registratie, beveiligingspoortjes, paspoortcontrole: all inclusive. Zoals verwacht, alleen maar oude mannen in donkergrijze pakken. En allerlei hoge piefen. In de plenaire zaal gingen wij als jongeren zichtbaar vooraan zitten. Zo zat ik recht achter de Eurocommissaris voor het Milieu – Janez Potočnik. Eigenlijk gewoon heel bizar. Deze geweldige man zat diezelfde middag nog in de Tweede Kamer, waar hij onder andere te maken moest krijgen met een aantal van onze kinderachtige politici. Wat mij betreft: plaatsvervangende schaamte. Ze moesten eens weten wat deze man allemaal doet, en waar hij bijvoorbeeld diezelfde morgen over stond te praten. Ook heeft Potočnik daar het belang aangegeven van Europese regeringsleiders om naar de Rio+20 conferentie te gaan. #DusRuttenaarRio! Het viel op dat er alleen maar mannelijke (bijna) vijftigplussers aan het woord kwamen (in totaal was er één vrouw), waaronder bijvoorbeeld de UN Secretary General for Economic and Social Affairs. Quite some people. Maar toen kwam het moment. Vragen uit de zaal! Yes, yes, yes – een ingang. En ik wilde hun ook een ingang bieden. Daarom besloot ik – na wat heen en weer gefluister met collegaatje naast me – mijn handen hoog in de lucht te steken. Ook Ruud Lubbers kwam aan het woord, en benoemde de Earth Summit in 1992 in Rio, waar hij ook bij was geweest. Uiteindelijk zei Yvo de Boer (voormalig hoofd UNFCCC) dat “the lady in the beautiful red jacket” de laatste vraag zou krijgen. YES! Mijn rode jasje tussen de saaie grijze onopvallende pakken had gewerkt. Maar toen kwam het er ook echt op aan. Namens de jonge generatie nam ik het woord en vertelde dat ik in 1992 niet bij de Earth Summit ben geweest, zoals de heer Lubbers, maar dat ik in dat jaar op de aarde ben gezet. Dat ik nu wil aangeven vanuit de jongeren dat wij dit willen, dat wij naar die groene economie, groene groei en duurzame toekomst willen. En dat we dat met ze samen willen doen. Samen met bedrijven zorgen voor goede groene banen, en goed duurzaam onderwijs om ons daarop voor te bereiden. Dat maakte gelukkig de gewenste indruk, waardoor het duidelijk was dat ook de jongeren aanwezig waren, en hun een ingang hadden geboden, waar vervolgens flink gebruik van werd gemaakt. De rest van de dag kregen we inderdaad talloze reacties, waaronder een enthousiaste mevrouw die me tijdens de uitgebreide (niet-vegetarische! tenzij je ernaar vroeg) driegangenlunch van tafel haalde en met een directeur uit India, iemand van het ministerie en een jongedame van een duurzame entrepreneursbewegeging bij elkaar zette waar een slim plan voor een nieuwe duurzame onderneming uit voortvloeide. That’s how we roll. Aan tafel zaten we met mensen uit allerlei landen, met interessante verhalen en ervaringen. En voor zover we de aanwezigen gesproken hebben, allen met de boodschap dat het de normaalste zaak van de wereld is dat de Nederlandse Minister-President Mark Rutte naar Rio+20 moet. Na afloop stapte nog de zogenaamde Directeur Duurzaamheid van de overheid naar ons toe (Directeur van het Ministerie van Infrastructuur & Milieu), die ons ook wel interessant vond, en die ochtend toevallig met staatssectretaris Joop Atsma had lopen sms’en over de afspraak die wij de dag erop hadden met Minister van Onderwijs Marja van Bijsterveldt. Helaas was deze gecanceld, maar hij vond het juist enorm leuk want was nog nergens van op de hoogte, en wilde graag hierop inzetten met ons, dus is het binnenkort tijd voor een koffiedate. Al die indrukken… en dat alleen al op dag 1 van 2. Nog in verstandsverbijstering van alles wat die dag over ons heen was gegaan, gingen we rustig naar huis om in de trein slimme plannetjes te smeden. Omdat er nog wel meer op de to do-list staat kwam van slapen helaas ook niet veel, dus moest het deze dagen op 3 uur slaap doen, aangezien de trein de volgende ochtend weer om 7.30 vertrok. En nu wordt het pas echt leuk. Zelf was ik al bij een sessie op de conferentie, maar mijn collegaatje had de trein gemist en was dus later. Ook de tram had geen fijne aansluiting, dus ze besloot toch gewoon de OV-fiets te nemen. Altijd leuk om via het Binnenhof richting Scheveningen te fietsen, dus dat is dan ook wat ze deed. Maar toen gebeurde het. Fietsend over het plein stapt opeens onze Minister-President Mark Rutte op zijn fietsie, heeft oogcontact met Liset, en ze groeten elkaar zomaar. Vervolgens fietste Rutte de hele tijd (heel erg langzaaam) achter haar, natuurlijk op weg naar het Catshuis, ondertussen met Stef Blok naast zich. Liset wist niet heel goed wat te doen, maar gelukkig kreeg ze toen de kans in haar schoot geworpen. Bij een kruising met veel autoverkeer moesten ze wachten. Liset tikt Rutte aan en vraagt hem of ze hem even iets mag vragen. Hij zegt nee, want is druk aan het overleggen. Maar uiteindelijk stonden ze daar toch te wachten. Dus hij draait zich nogmaals om en zegt: Wat wilde je dan vragen? 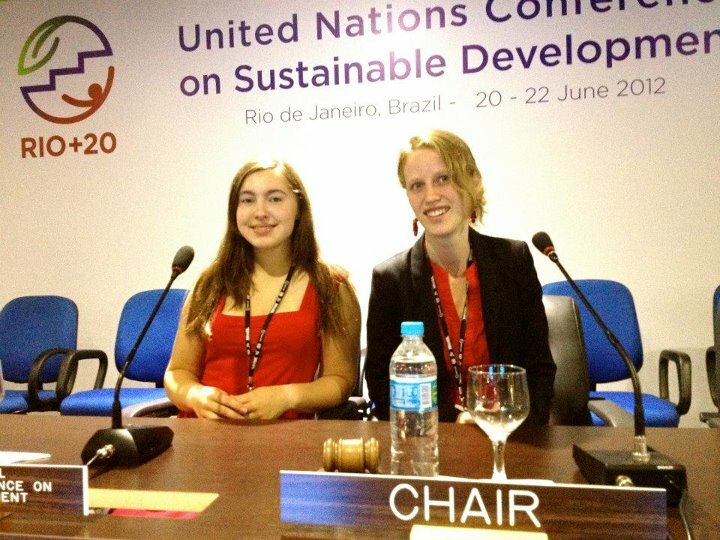 Liset legt uit dat jongeren hem motiveren om naar de duurzaamheidsconferentie Rio+20 te gaan…. maar dat was al te veel. Hij had geen tijd, te druk, nu even andere dingen aan zijn hoofd. Helaas. Maar hij weet het, hij weet het. Volkomen bizar! Vanaf dat moment waren we natuurlijk niet meer te houden en konden we alleen nog maar helemaal losgaan daar. Ambitieuze doelen werden gesteld, verbindingen werden gelegd en enthousiasme werd verspreid… Mijn collegaatje en ik waren de sessie uitgegaan om even wat dingen op een rijtje te zetten en voor te bereiden, en belandden zo in de wandelgangen. Jawel, waar het allemaal gebeurt. We zaten wat te praten, toen een man van de Guardian op ons afstapte en ons vroeg wat wij nou van dit hele gebeuren vonden. We waren hem eerder opgevallen en hij vond het interessant. En toen stelde hij opeens voor om wat we nu vertelden, straks aan de hele zaal te laten weten. Hoe dan!? Bleek hij de plenaire afsluiting voor te zitten… En wilde hij ons onaangekondigd het podium op halen. Wat een held! Natuurlijk zeiden we daar geen nee tegen! 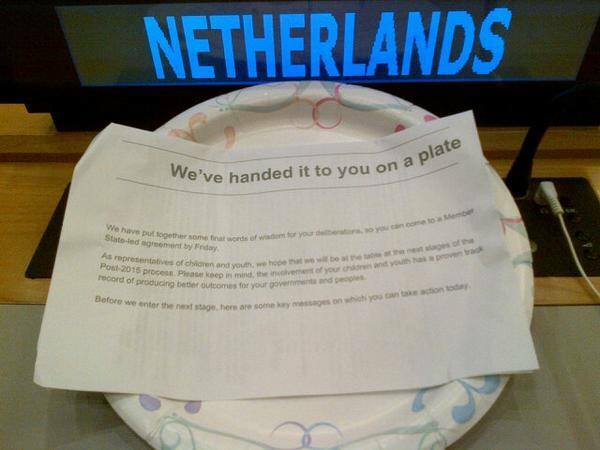 De top van het internationale bedrijfsleven en de VN toespreken on behalf of all children, youth & future generations – wat een kans! Ondertussen kwam Ida Auken binnen, een van de geweldigste politici van deze tijd, Deense milieuminister en echte powerwoman, en vlak daarna Jan Peter Balkenende, die tijdens de lunch zou spreken. Later zat hij vlak bij ons in de buurt, en omdat ik op de Nacht van de Duurzaamheid meer dan een half uur met hem heb rondgelopen en gekletst, herkende hij me gelukkig. We liepen even langs, en vroegen uiteindelijk of we na zijn verhaal misschien een paar minuutjes mochten lenen vanuit de jongeren. En daar was de volgende JA! Na zijn mooie verhaal wat precies aansloot op onze eigen jongerenvisie, spraken we hem een kwartiertje, afgezonderd van de rest van de conferentie, over de Dutch Sustainable Growth Coalition, jongeren en bedrijven, en Rio+20. Weer wat toezeggingen binnen. En ook hij had al gehoord van The Lady in Red… Zo hoort het! The Lady in Red heeft haar punt gemaakt. Van dit imago komen we nu dus niet meer af. En dat lijkt me meer dan prima! Eindelijk wat jonge, frisse actie tussen de grijze pakken. Op naar Rio! You can never have an impact on society if you have not changed yourself. It's not too late at all. You just don't yet know what you are capable of.